? Are Possums Dangerous to People or Dogs? Possums can look threatening. They look somewhat like giant rats. When threatened, they often stand their ground and bare their teeth, such as in the below photo. They have 50 sharp teeth. The look intimidating. But are they a threat to people or pets? Need opossum trapping? As of 2018 we service over 500 USA cities/towns! 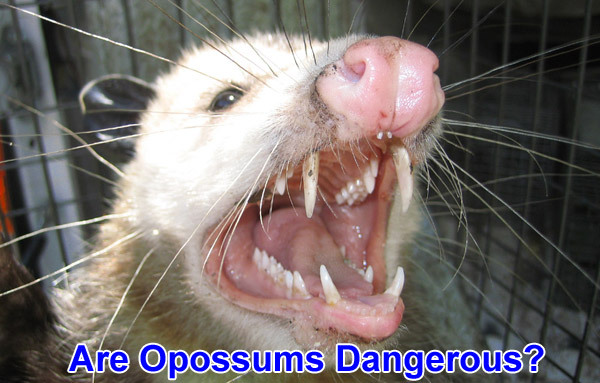 Click here to hire our professional opossum trappers - Your local trapper will give you a free price quote. The truth is that opossums are usually docile. This teeth-bearing threat display is just for show. You can poke the animal with a stick in such a state, or even put your hand near that mouth, and the opossum won't do anything! (I'm not recommending this, by the way, just sharing my own experience). In fact, as you may have heard, a more common response to danger is not for the opossum to attack, but to pass out due to sheer fright, or "play dead"! That said, in rare instances, opossums will attack, particularly when they have to defend themselves, just like any other animal would. So if your dog messes with a possum, and the possum doesn't play dead, it might bite back. In this case, a possum is dangerous to a dog or any other pet, like a cat. Below are two stories of cases I dealt with involving an agressive, potentially dangerous opossum, only defending itself in extreme circumstances. A possum will never attack unprovoked, and very rarely attack even if heavily provoked! It's much more likely to stay still or play dead. Still, click either of the below cases to learn more. It makes sense to know what you are dealing with when it comes to wild animals, especially ones that look simply terrifying such as the opossum. If you were to take away the fact that this animal is around the same size of the cat, has fifty razor sharp teeth, and claws that would rip open even the toughest of skins, you actually just have a frightened animal trying to survive, and this is what most people fail to remember. One of the things that opossums will do in order to avoid a confrontation with humans is play dead, and although many people believe this to be a myth, it is actually a true fact that you should know when dealing with the creature. Playing dead is now a phrase used by people often, but very few know the origins, and they stand right here with the humble opossum! A smart move that was designed to confused their opponents into thinking they had “won” the battle, causing the threat to then leave them alone to get on with their opossum lives. According to studies, the opossum itself has no control over this method of confusion, and it is actually something that is triggered within the brain to paralyze themselves temporarily, lasting from a few minutes to a few hours. In short, this means that the opossum has a natural inbuilt instinct to play dead when standing against bigger animals, especially humans, so rather than stay and fight, they would actually just appear to be dead. This very much works in the humans favor as the animal can then be moved to a more suitable position and placement, effectively eliminating the problem. While opossums are rarely dangerous, you might want to read about opossum predators. In general, possums don't have many, outside of the very people who help them thrive. Read about can a possum kill a pet cat?